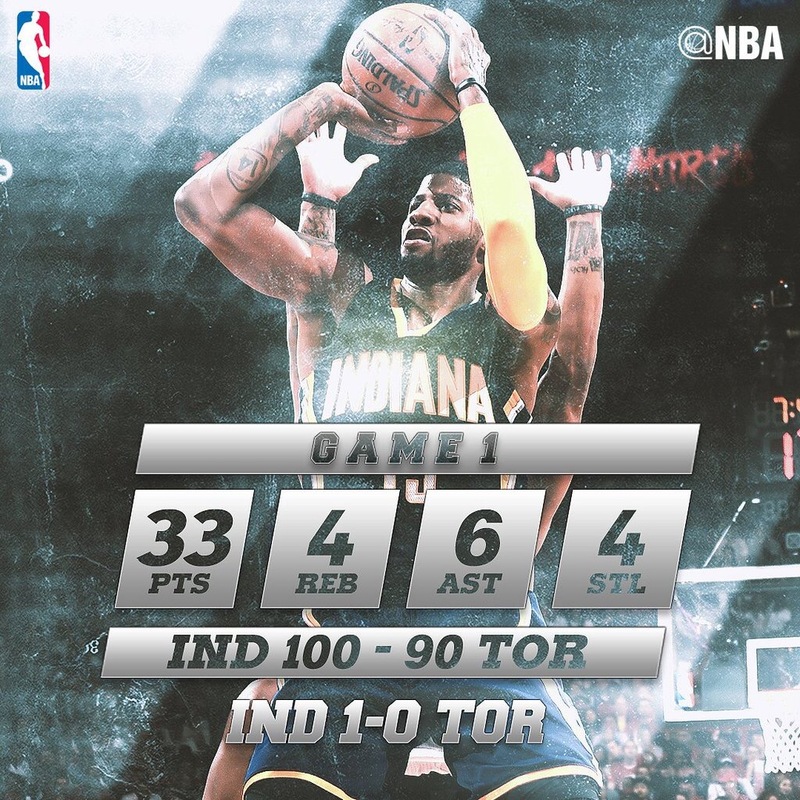 Thanks to a sizzling second half from Paul George (27 points on 10 of 13 shooting), the Indiana Pacers defeated the Toronto Raptors 100-90 and lead the series 1-0. It’s a huge win to open the playoffs as the team that wins game one wins the series 77% of the time, but if the Pacers want to cause the Raptors to go home after the first round for the third straight season via defeat to a lower-seeded team, there were some problematic areas that the Pacers can’t allow to become series-long trends. The Pacers clinched their 5th playoff appearance in their last 6 seasons (or they have made it every year that Paul George has had two healthy legs) by blowing out the Brooklyn Nets. At one point in the 3rd quarter, the Pacers led by 40, so the starters were free to sit back, relax, and enjoy the rest of the game. Paul George even managed to get a snack from a young fan sitting behind the home team’s bench. Paul George hasn’t been able to sit out a lot of final quarters this year, so it’s good to see him taking advantage of it. Get your popcorn ready, Pacers fans! The Pacers are in the playoffs for the 21st time since 1990, which is the second most in the NBA over that time period. They will face either the Toronto Raptors or Cleveland Cavaliers. With the Indiana Pacers trailing by three points to the Oklahoma City Thunder with just under a minute remaining in the game, Monta Ellis drove towards the lane. As Steven Adams and Serge Ibaka converged to help, Ellis kicked it out to the open man standing in the corner ready for the pass behind the 3-point line, 19-year-old rookie, Myles Turner. Win a Myles Turner signed 8×10 picture! The rookie, who had only attempted two 3-pointers and had made none so far this season, calmly gathered the low pass at his feet and immediately rose with confidence to take the shot. Nothing but net. Tie game. His first career 3-pointer and yet another Mylestone in the constant evolution of Myles Turner. Myles Turner learned a new skill. Something that seems to happen nearly every game for the fast learning, hard working rookie. At the start of the season, it was clear that Frank Vogel didn’t want to put too much burden on the Pacers first-round draft pick. He was going to play off the bench at the 5 spot, so he could focus on learning just one position while he got used to the speed of the NBA game. Myles came into the league with a couple of skills: A smooth jumper, his Turneround™ post move, and an impeccable sense of timing when it came to blocking shots. He used these skills to average 5.9 points, 3.4 rebounds, and 0.8 blocks in his first 18 career games and missed over a month and a half with a thumb injury. Modest numbers in about 18 minutes per contest, but you could still see flashes of his potential in every game. Turner was starting to show off even more skills: preventing dunks with blocks that recalled the memory of Roy Hibbert’s block on Carmelo Anthony in the playoffs, hook shots in the post, crafty, quick finishes in the lane. While he was still out of position at times on defense and Vogel knew it might be a “roller coaster,” Myles Turner was moved to the starting lineup, where Pacers fans hope he stays for a good 12-15 years. Not only is Turner starting, but Vogel is playing him at power forward alongside Ian Mahinmi. While Mahinmi has recently struggled to stay on the court, the Pacers are now 4-1 when the tandem starts the game. The result is a rare mix of spacing on offense, but an abundance of rim protection and rebounding on defense. Turner is blocking anything that comes near him at the rim and that includes serving up some smothered chicken to LeBron James. In the OKC game, assistant coach Popeye Jones told Turner that he wasn’t doing much on defense according to Jeremiah Johnson. Turner responded with 5 blocks in the 3rd-quarter alone. The lineup is just touching the surface of its potential in terms of spacing now that Turner can take open corner threes. As Turner proves he’s ready to hit the long range shots and Vogel gives him more freedom to take those, the spacing will continue to grow on offense. Myles Turner (18.0) has the second highest rookie PER in #Pacers NBA franchise history (min. 30 GP), behind only Clark Kellogg (20.3). The end result may be Larry Bird finally getting that fast paced offense with lots of free flowing movement and spacing, and Frank Vogel playing his preferred style of having two bigs on the court at all times. The best of both worlds. The always growing skillset of Myles Turner can do that for you. This has been a season of change for the Pacers, a year of transition: going from exclusively using slow, traditional lineups to having the flexibility of using both faster spread lineups and traditional lineups and from having an elite defense that forces inefficient mid-range shots to sending out an above average defense that forces a lot of turnovers; Paul George has returned and is better than ever. C.J. Miles is playing as a stretch four after 10 years of being a wing. There are seven players on the roster that were not on the Pacers a year ago. George Hill is blonde. Out of all of this sudden change, none of it has been more surprising than the vast improvement of everything in Ian Mahinmi’s offensive skill set. Shooting. Passing. Dribbling. Catching. Footwork. You name it; Ian Mahinmi got better at it over the off-season, an incredible feat for a veteran entering his eighth season in the Association. Rejoice for the NBA season is here! 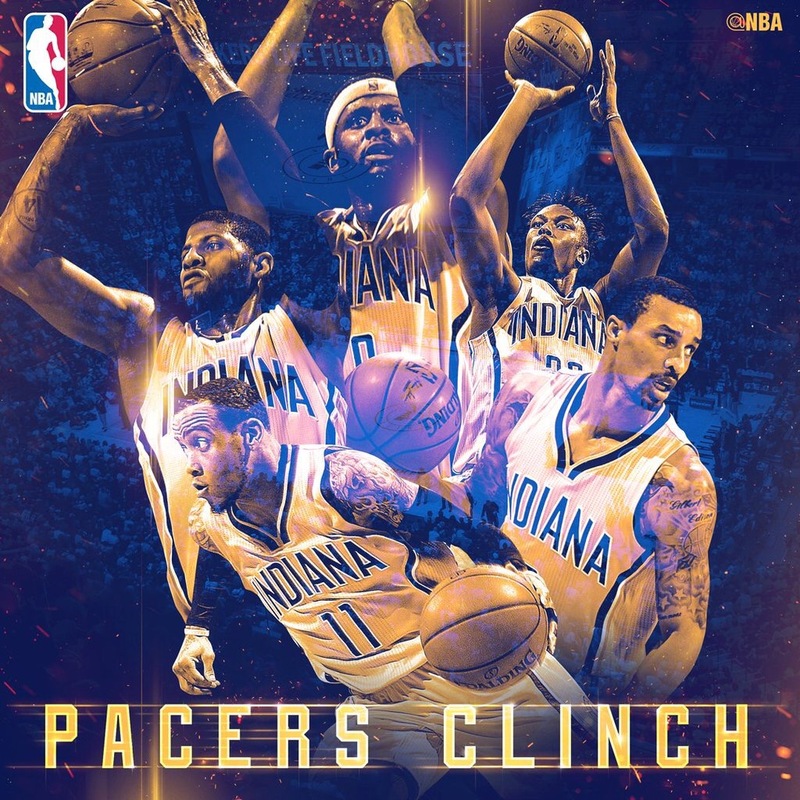 The Indiana Pacers start playing again tomorrow night! Their first opponent is on the road against the Toronto Raptors led by Kyle Lowry (also featuring former Pacer Luis Scola). In case, this is your first time here: Here’s the concept of This Picture Is Worth a Thousand Words: I take an interesting picture from the history of the Indiana Pacers from ABA glory to the modern era and literally write 1,000 words about the photo. If you missed the first of the series: Here’s my analysis of Reggie-Miller-tortured Knicks fans. Trying out a new blog post series today called This Picture Is Worth a Thousand Words. You can probably guess what this series will be, but here’s the concept: I find an interesting picture from Pacers history (from the way, way back in the ABA days to the glorious shots of the current team) and literally write one thousand words on it. This could be a disaster, but it should be a fun one. The roster is full: A Quick Overview of the 2015-16 Indiana Pacers. With the Pacers signing of Glenn Robinson III to a 3-year deal and acquisition of Rakeem Christmas via trade, the Pacers have quickly filled up their roster with 15 players now under contract. Only 8 of the 15 were on the Pacers squad last season, as 7 were either not resigned (Luis Scola, Chris Copeland, Donald Sloan, CJ Watson), were traded (Roy Hibbert, Damjan Rudež) or simply opted out of their contract to sign elsewhere (David West). Maybe, the most important part of this announcement is that we finally know why George Hill went blonde. It’s so his hair would match the Hickory Pacers uniforms. I must say, George, it’s a nice touch. Tell me what you think about Joe Young and leave a comment on this page for 5 additional entries into the raffle. If you missed the post on Myles Turner’s performance at Summer League click here. After missing his first game due to illness, Joe Young had a tremendous Summer League as he was the leading scorer in Orlando with 22.5 PPG. So, how will his game translate once the games start to matter? What does he still need to work on? Here’s an overview of what we saw at Orlando. Cap minutia: league has temporarily disallowed Monta Ellis’s contract w/ Pacers; team ran out of room, just has to re-order transactions. In other words, Monta will sign w/ Indy. Things will be fine. DEN got slammed for screwing up Faried’s contract, but it happens to others.